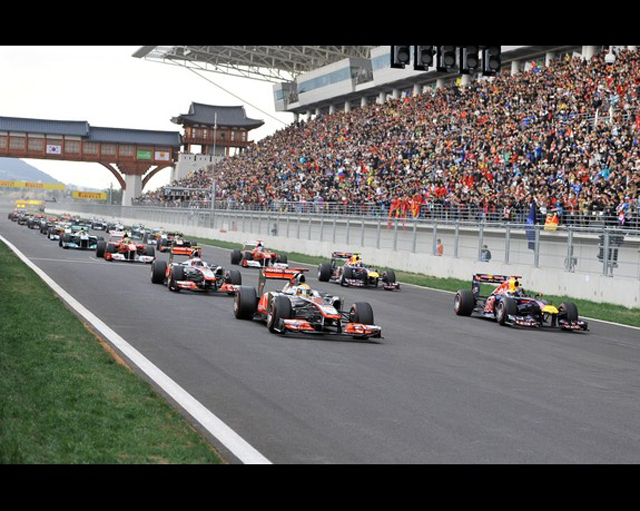 On the “wrap up” tour of the 2011 season the F1 circus landed in Korea for the second annual Korean Grand Prix. Red Bull Racing came into the weekend looking to clench the constructors championship to go along with Sebastien Vettel’s drivers championship. Although for a while it looked like Red Bull’s plans would be put on hold as Lewis Hamilton cleared the cobwebs that have been clogging him up all season and put on a stellar performance by capturing pole position during Saturday qualifying. His pole position was the first by a non-Red Bull driver in almost a year and he held off Sebastien Vettel’s hopes of tie-ing the record for most poles by a driver in a single F1 season. One would think Lewis would be elated at his accomplishment in light of his recent troubles but during the post-qualifying press conference he was strangely stoic. It seemed like he put all emotion aside and was in full race-mode all weekend. Unfortunately it wasn’t enough to keep him in front of the pack. When the race started Sunday Sebastien Vettel was able to make a pass on Lewis for the lead in the first lap and from there we know how the story goes. Although despite fighting understeer and immense pressure from Mark Webber Lewis was able to hang on to second place while Webber finished third. Sebastien’s win and Mark’s podium secured the constructors championship for Red Bull. Now we have three more races with a full rid of drivers who have nothing to lose. It will be interesting to see how end of the season will play out. For a full post race report check out what the SPEED TV trio had to say.